Colin Hodgson joins the crew for the end of year wrap up show. We discuss the HUGE news to start off the show as John Morres decideds to leave Kevin Martin just 7 months before the Olympic Trials in Winnipeg. As well we wrap up the Men's World Curling Championship, the Player's Championship & year end wrap-up. 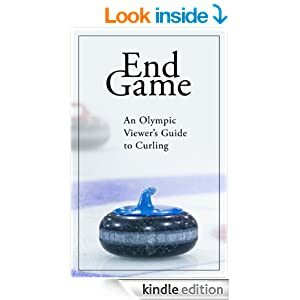 As I await yet another April snowfall in Central Alberta, I thought it was about time I refelected on the final chapter of the Curling Season. No, not the Players Championship, the Men's World Championships. The Players is, I suppose, the final event, much like the $10 million dollar Fed Ex Cup/Tour Championship is played after the PGA Championship. One day the Fed Ex Cup (or perhaps the 2037 Nike Cup) might carry similar historic signifigance, but for now Major Golf ends in August and not September, and Major Curling ends at the World's. And, with so many non-Canadian countries getting even better, this event will perhaps begin to gain acknowledgement that it does have some of the best teams in the world, even if there is only one competing team wearing a maple leaf. Am I the only one that hears the name "Players" and thinks back to the old days of corporate sponsorship by tobacco companies? You know, back (before 2000) when Canada still had an LPGA Major. 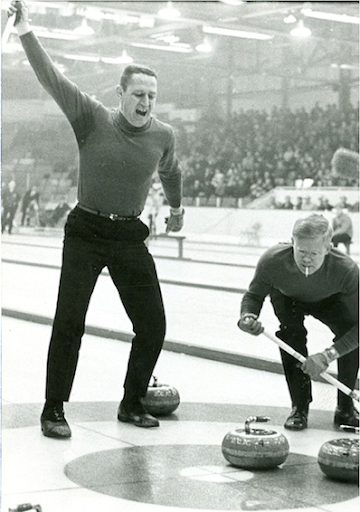 The Brad Jacobs rink would not fit the proper image for a poster from a "MacDonald (Tobacco) Brier. The Players will still be an interesting event, for a few reasons. Money: Team Rachel Homan is playing for $100,000 Bonus if they should capture the second of the Womens sponsored Grand Slams. Kevin Koe's squad you might recall lost their chance at $1 million when they were unable to win the Canadian Open, the 2nd Grand Slam of the season. They will have a chance to share in the $100,000 bonus split between the top 3 Mens teams, based on performance at all four Grand Slams. Fame: Team Brad Jacobs may have fallen short in their bid as World Champions in 2013, but their Brier victory and Silver medal performance puts them one single point ahead (ok, 1.025) of John Epping for the final "auto" berth to the Olympic Trials. The Players will provide the final opportunity for these two teams (or Gushue I suppose, if they both fail to show up) to capture that final spot and avoid playing in the Pre-Trials next November. Love: Played in the previous home of the once again mighty, lucky to sneak into the playoffs, Maple Leafs, this event is a test to see how much Torontonians love Curling. Many fans have thought a Toronto Brier long overdue. The Canadian National Championship (aka The Brier) was started in Toronto in 1927 and played there until 1940 when it started becoming "National" and moved to Winnipeg. In 1941 it was returned to Toronto for one more show and hasn't been back since. If this event can succeed, maybe our National Championship can return to Hogtown once again. Can you spot the Curling Club in this picture? While we anxiously await the Players, I'll take a look back at some interesting decisions made during the final weekend of the 2013 Mens Worlds. 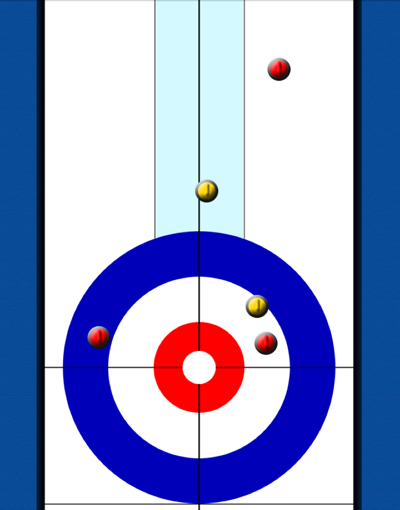 Before I analyze this game, let me make a suggestion to those folks who manage curling in Scotland and suggest you don't continue with a rotating 5 man team. 1. You can't substitute during a game. Just because Spike Albrecht was hitting three pointers in the NCAA basketball championship didn't stop their coach from bringing in Player of the Year Trey Burke (his two fouls did in the first half at least). If Basketball had no substitution and the option was playing Albrecht instead of Burke, despite Spike's being 6 for 6 on 3 point shots heading into the game, he still rides the pine. 2. There aren't really substantial differences in specialized skills. Again, looking at basketball, players have various skills which can be used in a game. Some players are defensive specialists, strong rebounders, or good sinking baskets from outside the three point line. Some have size, others quickness. 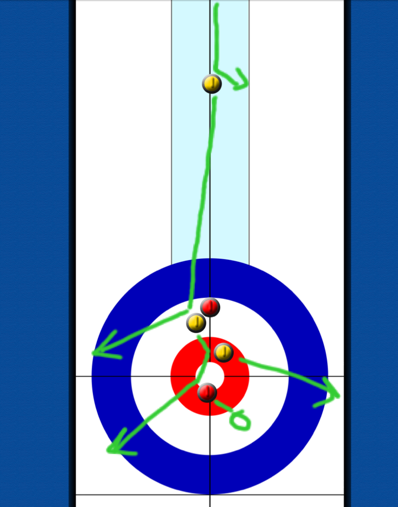 In curling, you need each player to make his shots and either sweep well or call line well. That's about it. Perhaps you could have a "tick" specialist or "heavy hitter" but these aren't significant enough to justify sitting a player over another for an entire game (see number 1 above). 3. Small sample sizes can lead to incorrect analysis. I know, it's easy to look at a player after the fact and determine that he or she was "losing it" or not at their peak. Maybe the truth is that person just isn't as good as you thought they were. Or more likely it's just the result of randomness. It's like a baseball manager "over" coaching during the play-offs and juggling the line-up in order to create more offence. If it works, and the team suddenly hits, they look like a genius, when the truth is the line-up has very little bearing on a single game (and some research supports it even has minimal impact on a 162 game season). If you are prepared to pull a player after the 5th game of an 11 game round robin, then you are assuming that their performance in the next game will be worse than your alternate, based on the outcome of 90-100 rocks thrown. That might seem like a lot, but it's actually a very small sample size, especially in a game where most shots are similar (and usually successful) and the difference between a made shot and a terrible one can be an extra brush of the broom, and error in communication or even a mismatched stone. I'd suggest you find your best four players before the event starts and play them unless someone is physically unable to perform at their peak due to injury (or excessive celebration). In the 8th end, down 5-3 with hammer, Scotland has a mess of guards and keep attempting raises when they could have drawn to the four foot, especially on skips first shot. Murdoch attempts the runback on hist first (blue shot) when perhaps a draw (green) could have had led to better chance at a deuce. Interesting that Sweden played the end very aggressive, perhaps because of the way the it developed or that was their original intent. The raise is missed and Scotland eventually makes a tap-tap (tap?) for a single point. Rather than throw a guard (green), Scotland choses to draw for second shot (blue), leaving Niklas a wide open hit for 1 and a 2 point lead. Not certain I agree with this call. They likely felt if the guard is too long the shot would be makeable by Niklas for 2 or 3 and if too short he would have a raise double for two. I much prefer creating some chance, if even slight, to steal, rather than surrendering an automatic single point. Two down playing the 10th and your chances are 11.7% but a steal will double your chances to roughly 24%. Even if you leave Edin a chance at two or more 20% of the time, you would only need to steal 1 in 10 for the guard to be correct. As it turned out, Edin actually missed his hit and stick and gave up a steal of one. So much for my analysis, I guess they were right all along. In the 10th end, Murdoch is unable to put his last shot in the perfect spot and Edin makes his draw to the four foot for the win. Rasmus keeps Canada close with a couple of misses. In the 3rd end Denmark scores 2 rather than 3 and a possible steal in the 5th end is turned into a blank when he is unable to get an inside roll with his last. Rasmus makes a nice freeze in the 6th end after Jacobs comes deep with his first, but an angle double allows Canada to take two points and regain the lead, 4-3. I liked the force Canada played in the 7th end. They could have thrown a guard, attempting a steal but would have left two different angle raises for two. They instead chose to hit an open Denmark rock and ensure no worse than a single, and the final shot by Stjerne had some amount of difficulty. 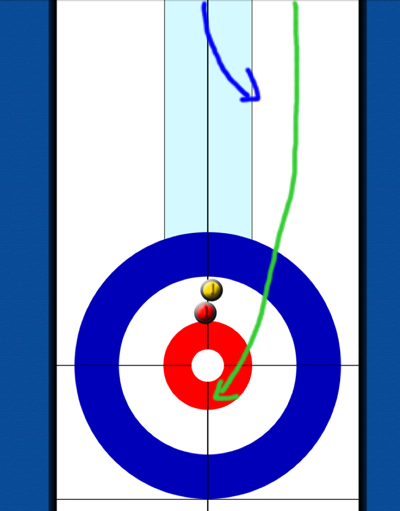 In the 8th end, Rasmus attempted two raises with his final shots, both times removing shot stone but unable to keep their promoted guard in the rings for shot. The result is a deuce by Canada and a 6-4 lead. On his first, Rasmus attempted to remove a Canada stone biting the top four foot. He could have attempted a draw around to the back four rather than the raise, but perhaps the spot did not curl enough or he was less comfortable with that shot. 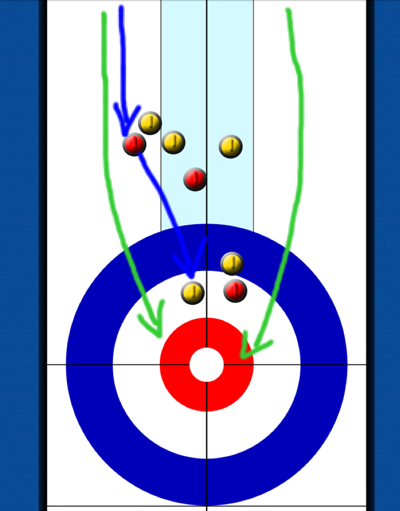 In the 9th end, Denmark chose to throw up another corner guard on third's last rock (blue). They could have chosen to draw around the top two rocks at this stage (green). I might have preferred this over the guard. There is some danger in the come around leaving a chance for Canada to clear everything, but that could be avoided with proper placement of the rock. This call also brings in the slight chance of a three point score (anyone see Howard versus Stoughton a few weeks ago?). 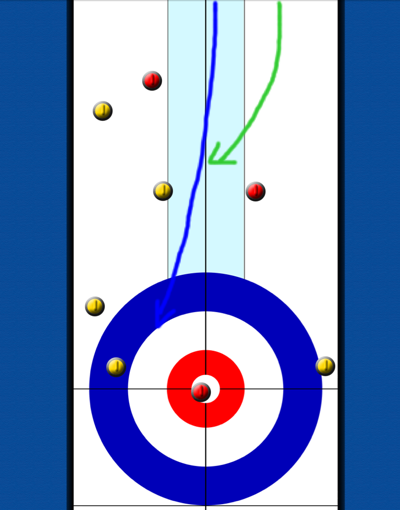 They consider this shot on skips first stone but instead choose to hit their top yellow and attempt to roll away. Good case can be made for both shots at this stage as either call can result in a deuce, much depends on the skip's comfort with the shot. Brad has a good chance at a double but throws his final shot a little wide and Denmark is able to draw for a deuce. Even Ryan's usually stoic dad, 1979 Brier champ Barry Fry was seen on camera sharing a Wiser's clap. On Denmark's first skip rock, they choose to tap back Canada to sit two behind the tee and their shooter stays top twelve foot. Brad chooses to draw top button and Jacob's final shot isn't needed to secure the win. Jacobs makes a mistake two shots later however. Choosing to come around the corner guard at an attempt for a possible three, he leaves Murdoch a double and the result is a blank. I didn't like Brad's call for a come around here because his shot stone was nearly wide open (perhaps 1/8 buried). 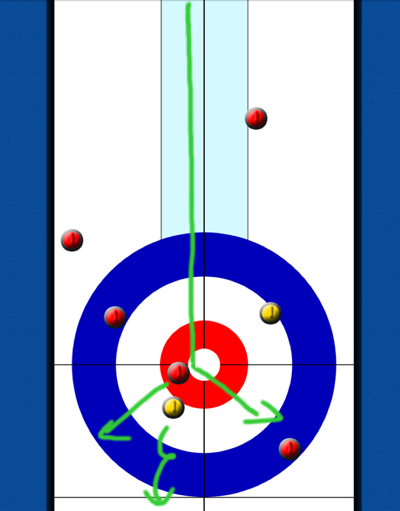 I wrote about a similar call during the 7th end of the 2012 Manitoba Provincial Semi-Finals. Jacobs is trying to make a teaser shot, but he can't make a shot where Murdoch won't have a high percentage chance to pick him out anyway. In other words, the chance for three is very slim. Better to play to the open side and ensure the deuce. Murdoch choses to try a hit and roll and ends up sitting on the nose. An alternate shot might have been to play a split on the top yellow rock. I rarely see this type of call but when used at the right itme it can create difficulty for the opponent. It may have been too early in the end in this example, but after Ryan Fry hits on the nose, Scotland calls the same shot on thirds first. They end up making the hit and roll and Canada is unable to make a runback double with the tight guard. Jacobs avoids a deuce primarily because of a miss on David Murdoch's first stone. On his last, David could have chose to double off the top two Canada stones for a blank, but instead elects to draw for his single. With 5 ends remaining, taking one or blanking is nearly identical (39 to 40%) so he should call the shot he expects to make more often. 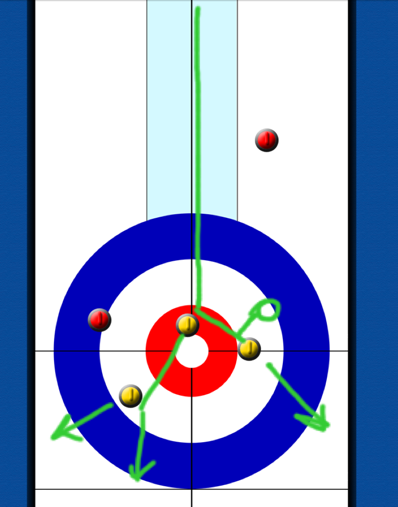 They choose to try a double on the two red Canada stones, hoping they will stick to sit two (green lines). A difficult shot that David ends up missing by a fraction of an inch. The result is a soft inturn hit for three and a 5-2 lead by Canada. Scotland would have been much better choosing to freeze on top of the Canada stone or attempt a nose hit to sit shot stone in front of Canada. Even if the angles didn't align well, a 3 would not have been possible. One of these shots also gives them a small chance at a steal. This is a case where one poor call shifted the game and a mistake in strategy played as large a role in the outcome as execution. A steal in the 8th and Canada ends up with a win after 9 ends.